In the last nine years since the notification of the Delhi Master Plan 2021 despite a commitment to plan for an additional population of 48 lakh by 2021, the DDA has to date, not prepared detailed urban design plans, or detailed services infrastructure plans for areas of future growth. The very basic outline land use plans incorporated in the Zonal Development Plans for different areas, are the only documents available. These have also completely changed with the notification of the development control norms for the proposed Transit Oriented Development (TOD), but Zonal plans have not been revised. Without acquiring land and developing the access roads, laying out the upgraded network of services that would include sewage, storm water drainage, electric supply, and the whole paraphernalia of telephone and digital services, actual development as proposed is just not going to happen. This is particularly true of the intensive development zones along major transit corridors. One of the important recommendations of the Delhi Master Plan 2021 notified in February 2007 was, that Influence Zones along the metro rail and major transportation corridors (TOD) be declared as intensive development zones. It was suggested that a 500 mts wide belt on either side of such transit corridors be designated as an influence zone in which higher FAR and height may be availed of, through the preparation of comprehensive integrated schemes. 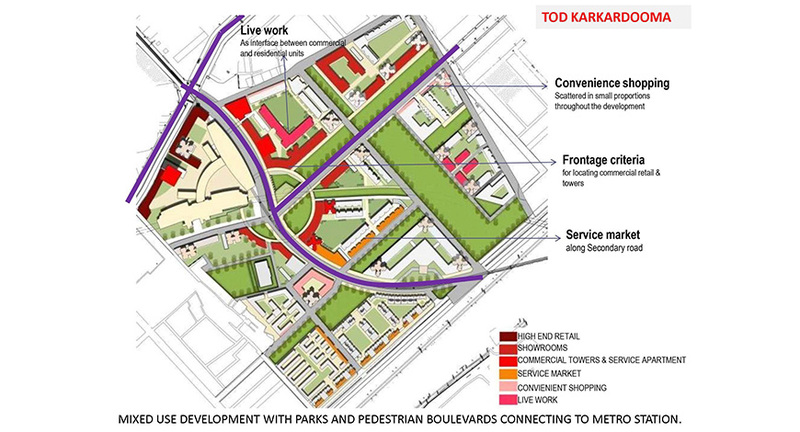 The TOD Corridors were to be part of an integrated multi-modal transport system, effectively integrating a mix of rail and road based systems, which would include metro-rail, bus rapid transport, feeder services, taxis, auto-rickshaws, and private modes. In addition all roads would be made pedestrian, and bicycle friendly, and safe for children, elderly and the disabled. 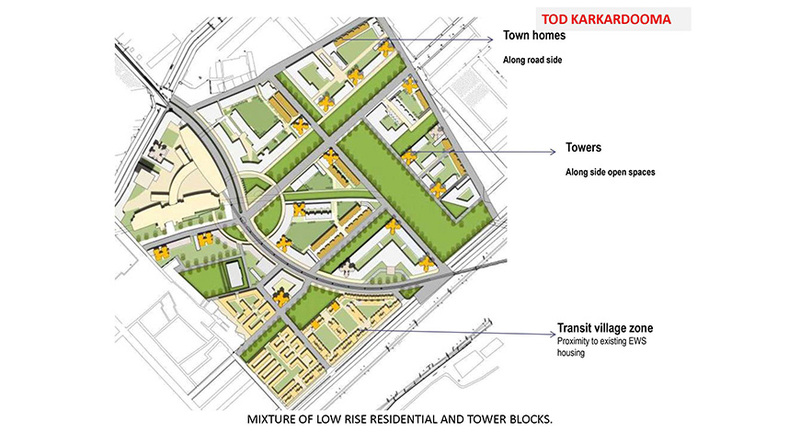 It was suggested that the development follow a concept with emphasis on safe pedestrian movement instead of the present traffic dominated road system, effectively connecting and servicing a wide area along each TOD corridor. In October 2012 DDA notified the first four TOD developments to be implemented, the Karkardooma corridor in East Delhi, the Chhatarpur - Arjangarh corridor, the Nehru Place - Badarpur corridor in South Delhi, and the Dwarka corridor in West Delhi. 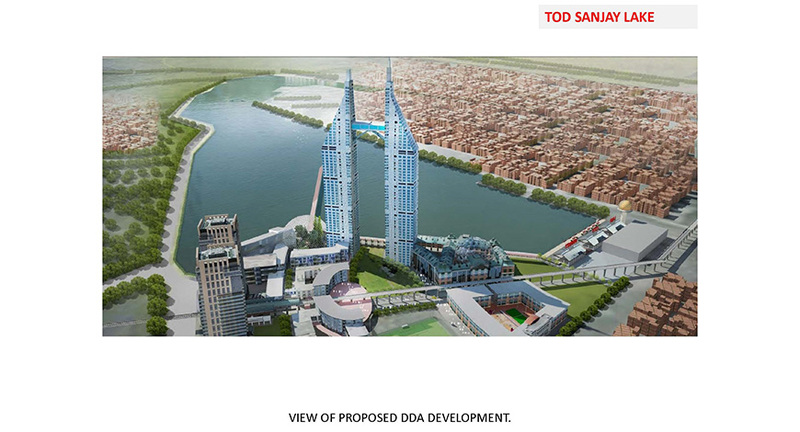 To date, basic plans have been prepared for only two isolated pockets of land, the Karkardooma site, and an area adjoining Sanjay Lake in East Delhi, both of which are being promoted as prototypes of the TOD concept. Expansion of the metro rail network is proceeding at a fair pace and while this is improving connectivity, the necessary integration of the metro system with the existing road network, and surrounding areas is not happening. There is no synergy between the overall Delhi Master Plan development proposals, the DMRC network, and the major road corridors. Major roads and the metro rail system have been simply overlaid on the existing structure of the city, resulting in severe congestion and disruption in many locations. The suggested development of a multi-modal transport system with emphasis on safe pedestrian movement has not occurred. In this context the implementation of intensive development along the major metro rail corridors without proper planning, is certain to further aggravate traffic problems. 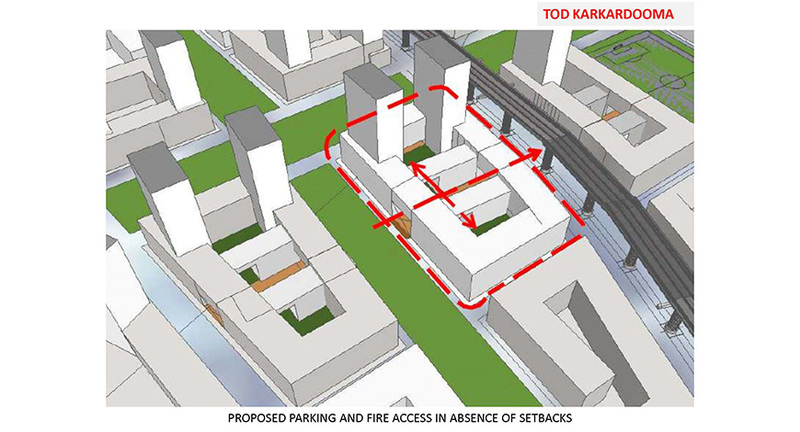 If DDA had maintained the necessary professional support infrastructure, it could have prepared urban design proposals for different segments along the corridors, carefully analyzing actual ownership of land, the existence of facilities that need retaining, along with the upgrading of the services infrastructure. Such an exercise would have helped them understand the formidable difficulties in implementing the proposals across heavily built up parts of the city. Unfortunately DDA does not now have, the capability to carry out any such detailed studies. Let us take a look at the situation existing along the Vikas Marg - Karkardooma Corridor on which the first proposed TOD at Karkardooma is located. Starting from the East bank of the Yamuna river, Vikas Marg with a 45 metre right of way passes along Lakshmi Nagar on one side, and Shakarpur on the other. This is one of the most highly congested areas of East Delhi, with small residential plots served by narrow access roads. Although these are planned colonies, haphazard unauthorized development has led to the construction of 5 and 6 storey high buildings, with a complicated mixture of uses, including commercial, residential, and communal, on different levels. All the way up to Nirman Vihar, the area is a hive of intense activity, with the main road congested throughout the day, carrying a mixture of motor vehicles cars, buses, electric rickshaws, three wheelers, cyclists and pedestrians. Conditions are chaotic, and the 45 metre wide corridor, which includes service roads on both sides, barely manages to accommodate the large variety of slow moving transportation, that serves the needs of residents living in the area. Riding overhead in the centre of the traffic corridor is the metro-rail, with a series of stations along its length. The proposal to develop this area as a kilometre wide strip of high density mixed use development, consisting of multistory towers is virtually impossible to implement. It will be difficult to acquire the plots required to create units of one hectare (2.5 acres), which is the minimum area needed to take advantage of the redevelopment proposal. The density of existing construction is already well above the 400 FAR being offered as the incentive to redevelop. The fact that the entire area is overcrowded with narrow ill ventilated streets, does not detract from the fundamental fact, that this massive concentration offers cheap affordable housing to large numbers of low income workers, close to the heart of the city, with the metro corridor providing efficient connection to work centers all over the city. The area has almost no schools, health centers or open recreation space within easy reach. Because of complex ownership issues relating to individual properties in this area, it will be difficult to demolish, reconstruct, or change existing structures, for some time to come. After reaching Nirman Vihar and the Lakshmi Nagar District Centre, Vikas Marg passes through a number of well developed, middle, and high income residential colonies. Here the densities are reasonable with good living conditions, and a pleasant ambience. Here also, the possibility of being able to put together consolidated sites of one hectare area, in order to take advantage of intensive mixed use development are limited. Recognising this reality, DDA has now zeroed in on the proposed development of a few vacant pockets of land that it happens to own, in Karkardooma, Sanjay Lake and Mayur Vihar Phase I. All three projects are being promoted as Transit Oriented Development in order to take advantage of the increased permissible FAR, because of their being next to metro rail lines. In reality they do not represent high intensive development corridors as per the TOD concept, nor do they conform to the notified guidelines. There is no possibility of any of these triggering continuous development over large areas, because all three are relatively isolated sites, surrounded by extensive built up areas. The Karkardooma development site is an area of 29.83 hectares (approximately 74 acres) located at the far end of the Delhi urban area, adjoining the Anand Vihar railway station. It happens to be an area of DDA owned land, surprisingly clear of any unauthorized slum settlements. The project is being developed along with NBCC and has been conceived in some detail incorporating the recommendations made in the original DDA - UTTIPEC studies. It has been planned as a series of separate mixed use blocks, laid out around the metro station, with a well defined system of parks and open spaces. Emphasis has been laid on unobstructed pedestrian connectivity across the entire development. Housing has been planned as a series of separate blocks, in a combination of midrise and highrise buildings creating separate neighborhoods, overlooking substantial parks and green areas. All of this is effectively serviced by a system of primary and secondary roads along with proper parking areas on the inside of the blocks. 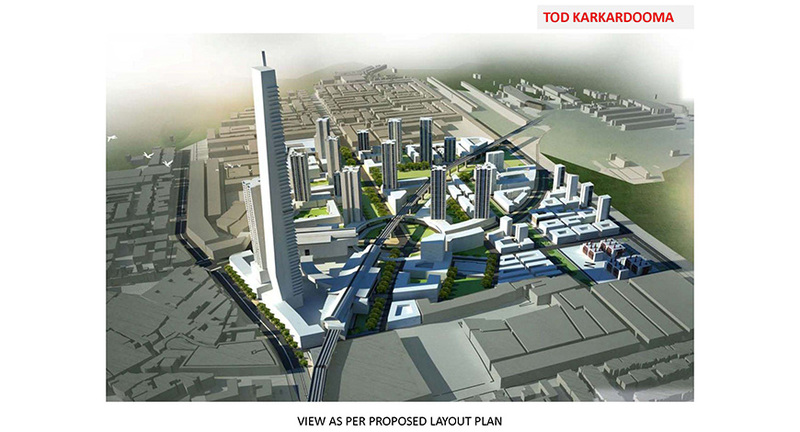 The overall concept as proposed is attractive, and well worked out. 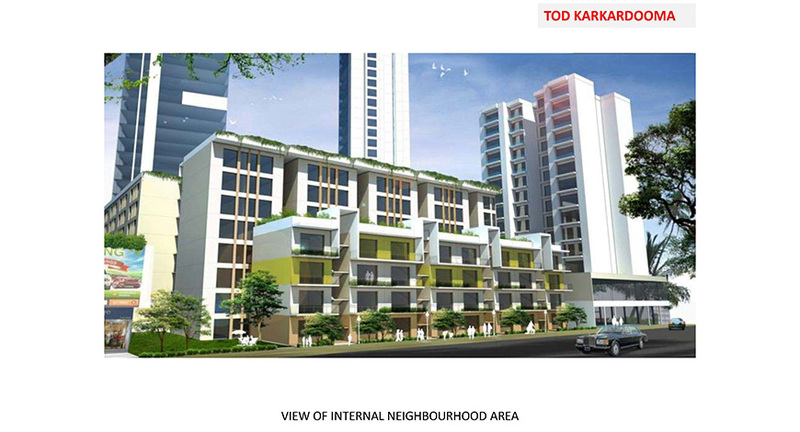 For the residential component the size and mix of housing units as proposed are not in conformity with the Development Control Guidelines notified for TOD. As per the guidelines the mandatory residential component shall comprise 50% units of size ranging from 32 to 40 sq m area, and the balance 50% may be of maximum 65 sq m area. The units as designed do not meet this criteria and do not effectively address the needs of the EWS community. In fact 38% of the units are proposed to be of 100 sq m area. This clearly indicates DDA's focus on marketability, which will effectively convert the development into a middle and high income residential development. Along with this, the other element that stands out as a striking misfit is the proposed iconic 100 storey tower, which as a landmark for East Delhi is totally misplaced. 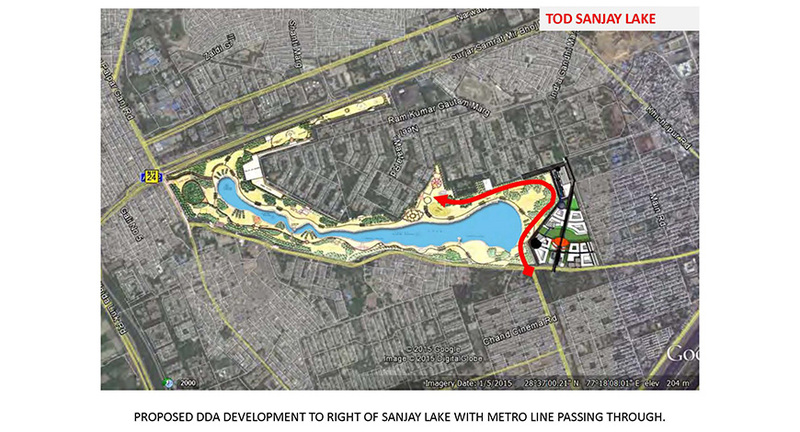 The Sanjay Lake project is on a site of 10.26 hectares (approximately 23.3 acres) at the eastern end of Sanjay Lake where the Trilokpuri metro station is to be located. It adjoins the large low income settlements of Trilokpuri to the South, and Kalyanpuri to the East. 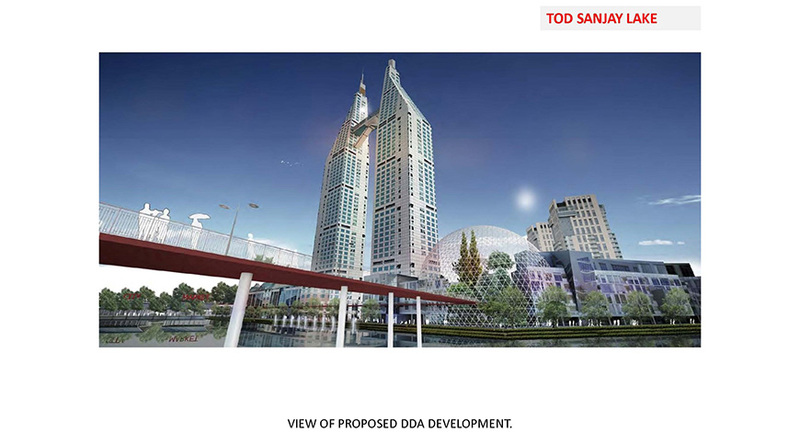 Directly North of Sanjay Lake park, is the DDA built middle income housing development of Mayur Vihar Phase II. DDA in association with NBCC are proposing to develop the site with a variety of civic uses, sports facilities, convenient shopping, as well as hostels, old age apartments, single room/two room apartments, serviced apartments, dormitories, etc. The residential units are to be part of a couple of multistory tower blocks overlooking the lake. 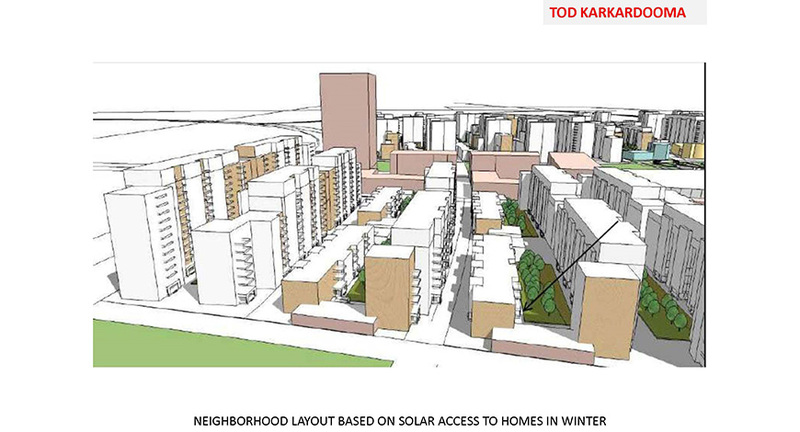 Here also the residential component deviates significantly from the prescribed TOD control norms. Considering the way in which NBCC have developed previous projects on government land, it is somewhat difficult to believe that these facilities will really cater to the vast low and middle income residents of the surrounding areas, or end up as a middle and upper income gated enclave. This is highly likely because of DDA & NBCC focus on realizing maximum profit from the select location. The major plus point of this particular proposal however, is that NBCC in developing this project has also undertaken to properly develop and maintain the entire Sanjay Lake park on an ongoing basis. This in itself is a commendable commitment, as DDA until now has developed the Sanjay Lake park in a rather slipshod manner, with large areas lying neglected, and filled with rubble. Despite its poor condition and lack of security the park is extensively used as a recreation facility by residents of the densely built adjoining settlements. For any integrated scheme, a maximum FAR of 400 and a maximum density of 2000 persons per hectare (PPH) is permissible. The entire amalgamated plot will be considered for calculating the FAR and density. FAR utilization shall not be less than 400. Mandatory EWS FAR of 15% over and above the maximum permissible FAR shall be applicable. Additional FAR may be availed through TDR only for schemes larger than 1 hectare. The norms and guidelines on the basis of which the gazette notification has been issued have been drafted by DDA. Is it to be understood that these norms do not apply to DDA & NBCC projects? Do these regulations not apply to projects built on government land? Are these rules applicable only to projects developed by developers and private citizens? It is important that the Ministry of Urban Development clarify these issues, and consider appropriate steps for rectification of the control guidelines. The current situation has arisen essentially because of lack of proper application of mind by DDA planners, and administrators. Had they carried out some design exercises of urban projects before drawing up the development control norms, they would have had a better understanding of the urban issues involved, and come up with a more realistic set of control guidelines. It is quite clear from an examination of the proposed DDA projects, that if the proposed intensive development along any of the major transit corridors in the city are to become a reality, it will only happen if the entire set of regulations are reviewed and modified, along with the detailed design of the transportation and services infrastructure, along the entire length of the proposed TOD corridor.